Confession: My senior year of high school, I dropped calc the second week of school and switched to stats. I loved stats (this was a fortuitous discovery) and found it really cool. With stats, you can reliably predict the probabilities of winning at craps on a roll-by-roll basis. With stats, you can make better picks during March Madness and increase your probability of winning the office pool! 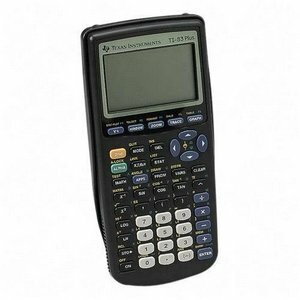 Above all, with stats, you can finish all your homework during class and use your TI-83 Plus for its true purpose: playing games. I’ve had a hard time letting go of this silly old calculator because every time I look at it, I think, “Someday I’m going to put some batteries in this thing and play Insane Mailman, just one more time.” But here’s the truth: I have no clue how to operate this thing anymore. Besides, it’s got a two-tone screen and operates via key commands. That’s so uncool. So today I’m releasing it to Goodwill. I hope that some day, somebody finds it at a thrift shop and tries (in vain!) to beat my top scores.